Now that I know how to look, (thanks guys!) they did scary good matching my opponent, both at 1.7mil and some change with a whopping 11 GP differential. My opponent can't even make a scratch in my Revan (whom I put on defense). What's the point in that? Thats kind of where Im at too. Im going to completely rock this guy. And you're right, GP is....deceiving. Mostly because of the sheer volume of characters/ships, multi-tiered gear, levels etc., etc. And everyone clamors about making the matchmaking more fair or more accurate but Im not really sure how that could be more accurately assessed other than by GP. Im not a coder and know very little about the skill but Im not sure how difficult it would be to create an algorithm, assign values to things like total zetas, each tier of gear on characters, etc. Would love someone to pitch an alternative or addition to GP though. Yet another time-sink, in a game that already requires way too much time. I mean the Grand Arena unlocks at level 85 so if you aren't okay with putting lots of time into this game at this point, why are you still playing? It looks like the matchmaking is decent from what I can tell. Assuming the search i did on swgoh.gg is accurate, I'm matched against a player with about 6k gp more than me. When you remove ship gp (which doesn't matter since you can't set ships) they have a 25k advantage. But I have more g12 characters. But if you look at the total number of g11/g12 as a group it's pretty close. Then g10, g9, and g8 are all pretty close. They have 19 zetas and I have 26. So overall looks to be a pretty even match. I think I actually have an advantage due to my top characters being more developed teams and my opponent appearing to have more random characters but that can't be helped in the matchmaking. Also my zetas are on better characters in my opinion so I should do well. Though I would expect to have an advantage since I have a fairly lean roster with mostly currently good teams geared up. But I'm sure those with lean rosters will win the first few rounds and then start being paired against each other since the win ratio is part of matchmaking. Why during the setup phase can I not take off squads that I set on the table? I have never play territory wars and so I feel screwed not knowing that they are all defense now. Match making fail - GP match is quite close, yet my opponent has 300% more zetas, +3 G12 / +4 G11 / +12 7*, +G12 7* chewie - The zeta and gear discrepancy spells doom for me! Basically the lesson is "only focus on exactly 1 team to G12 and ignore everything, rinse then repeat - Otherwise your GP will be inflated and GA will cause a mismatch". Ohh well right..
That strategy also helps you do better in other areas. Like raids. I only gear characters if I have a use for them. Since the harder portions of the game requires a team (hstr), I gear one or two teams at a time and have a pretty tight roster. There really isn't much use of having 300 characters at g8 that you don't use after all. But don't worry, if you lose this one that will be taken into account in the next match making. Eventually, those with tighter rosters that win more will start facing each other more and you'll face those that lost in the last round. Why is it based off total GP if there are no ship nodes? Im facing someone that has 200K more in characters then me, but my fleet is far better. If grand arena has no fleet component its punishing those that invested in ships. If it is pure characters then make match making based on character GP not total GP. I was so excited when they mentioned setting fleet defenses. Now I feel like I’m being penalized for investing in ships. This is just a quick trial run with 1 opponent instead of 7 others. The original post mentioned fleets so I am sure it will be incorporated in the full version in some way. Maybe round 3 is ship heavy or something. They definitely referenced ships, so I'm sure they will show at some point. That would be kind of silly to have a tournament format and have completely different aspects for each round. Better ships helps you earn zetas faster, That helps you have better teams. I bet if you check, you have more zetas than them. ...And everyone clamors about making the matchmaking more fair or more accurate but Im not really sure how that could be more accurately assessed other than by GP. Im not a coder and know very little about the skill but Im not sure how difficult it would be to create an algorithm, assign values to things like total zetas, each tier of gear on characters, etc. Would love someone to pitch an alternative or addition to GP though. You could certainly create a more granular breakdown of expected GA effectiveness using some of the data points you cite. The problem is that you still don't know that your newer, more complex algorithm will actually be more effective. You're just giving it your best guess. The means by which you judge an algorithm's accuracy will also be the most important data point for improving that algorithm: actual wins and losses (and possibly the scores within those wins/losses). If CG says they're improving their algorithm, I will give them the benefit of the doubt and assume their new algorithm focuses on past wins & losses. They already have win/loss records for TW, but it will take them some time to gather similar data for GA.
Once they have some win/loss data for everyone, they should theoretically be able to assign ever-closer matches with a sort of self-refining algorithm. For further detail into how such an algorithm might work, I would recommend looking into the "strength of schedule" metrics utilized in NCAA basketball and football rankings. I agree it would be silly. All I was saying is we don't know how ships will play a part yet. Once we know, people can complain how they've been wronged. And then the other 50% will say it is WAI. As far as I understood it W/L won't be in an all times use, just in your ladder pairings. @CG_SBCrumb I'm confused...do we set only one team on Def for first round? And then set one team on Def in the next and on and on or do we set all 6 Def teams at beginning? "This reward structure is only for this exhibition run of Grand Arena and will change with future Grand Arena events. A typical grand arena will take place over several days, and will have commensurate rewards. This first one lined up to start on 12/6 is a single round of the event and therefore the rewards reflects the shortened time frame. Future events will have different structures and could include formats such as 3v3, Fleet battles, or a whole host of other competitive ideas that our developers may come up with!" Wow I’m honestly shocked that so many are already complaining about the game mode in general. Personally I’m psyched to be able to use the entire depth of my roster against a new opponent in PvP. I will say this... matchmaking is the most important aspect of this mode and it needs to be tight for players to enjoy it. It appears to need some work, many in my guild have wildly lopsided matches in both sides of the spectrum. We have said for months that we’re wantjng new content and before the first shot is fired some are beside themselves with temper tantrums. It’s possible to be excited about the game mode and still have complaints about how they can improve it. 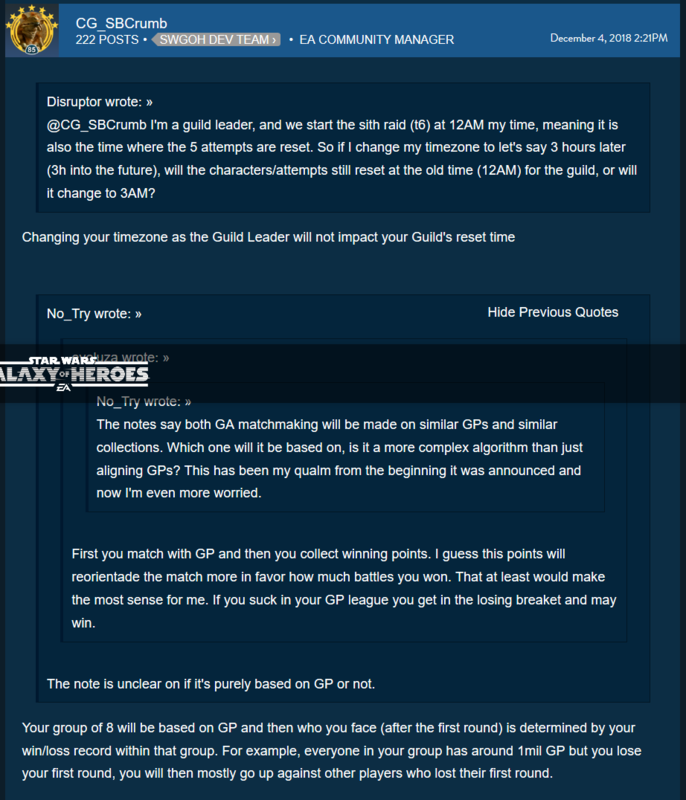 Is there some post from CG stating GP is the only matchmaking factor? Or is it just a commonly accepted assumption within the community? I like TW, so i think I will like this. Just like TW, it is VOLUNTARY. If you don't want to do it, don't sign up. It is an additional game mode. Ignore it if you hate it. Prepare for it if you like it. Constructively, I hope they fine tune the system a bit more as we go along.